Together, the Red Nose Day Everyday Heroes are helping to end child poverty. Hover your mouse over each Hero to learn about their super powers. You can be an Everyday Hero, too. Noses on! Gives children a safe place to live day and night. Delivers school supplies to children in need. Gives power to help end child poverty. Brings food to hungry children every day. Delivers medicine to sick children super quick. Together, the Red Nose Day Everyday Heroes use their powers to help end child poverty. You can be an Everyday Hero, too. Noses on! Increase your impact with a box of Everyday Hero Red Noses. After Red Nose Day you can recycle your Red Noses and Red Nose packaging at any Walgreens store and we'll turn them into items that continue to support kids. Money raised through Red Nose Day supports programs that keep children safe, healthy and educated in America and around the world. To learn more about the positive impact made by Red Nose Day, visit RedNoseDay.org/Impact. - Lee Andrews, VP of Corporate Affairs at Mars Wrigley Confectionery U.S.
Walgreens is dedicated to helping people everywhere, every day. Because Every One Counts. Get vitamins here. Change lives everywhere. Walgreens has teamed up with ME to WE to empower people to change the world with their everyday choices. Red Nose Day is a campaign to end child poverty, one nose at a time. Through the power of entertainment, Red Nose Day raises money and awareness to help keep children in need safe, healthy and educated in America and around the world. Red Nose Day returns on Thursday, May 23, 2019 when millions of Americans, celebrities and businesses will come together wearing their Red Noses—sold exclusively at Walgreens—to fundraise, donate and tune in for a special night of programming on NBC. How did Red Nose Day begin? Comic Relief, the charity behind Red Nose Day, was founded by Richard Curtis (award-winning writer and director of films like Love Actually and Four Weddings and a Funeral) as a way to harness the power of entertainment to drive positive change. The first Red Nose Day took place in the UK in 1988, and since then it has raised over $1 billion globally. Red Nose Day came to the US in 2015 dedicated to ending child poverty. Money raised supports programs in America and around the world that ensure children in need are safe, healthy and educated. Where can I buy a Red Nose for Red Nose Day? Purchase your Red Nose in store exclusively at a Walgreens or Duane Reade near you between April 22-June 1, or purchase in bulk online. Red Noses are available in a box of 40 or a box of 240 at Walgreens.com/RedNoseDay. How many Red Noses can I buy at a time? As many as you want! However, if you would like to buy in bulk then we recommend ordering online. Stores are unable to sell multiple boxes of Red Noses. Red Nose Day and Walgreens are thrilled to introduce a collection of five character Red Noses: the Everyday Heroes. The Everyday Hero Red Noses remind people of their own power to make a difference. This year Red—the original Red Nose is still part of the mix—and is joined by Ruby, Rusty, Rojo and Scarlet. Each has a superpower to help end child poverty. The Everyday Hero Red Noses are sold in a "blind bag," and the Red Nose you choose will be a surprise. The Red Noses will be sold for $2 each. All profits of every Red Nose sold go to the Red Nose Day Fund to support programs that ensure children who are living in poverty are safe, healthy and educated. While the price has increased this year because the characters cost more to manufacture than the traditional Red Nose, this price increase delivers a greater donation—$1.30—to the Red Nose Day Fund. Walgreens does not make a profit from Red Nose sales or any Red Nose merchandise. No portion of the purchase is tax deductible. Do the Red Noses contain latex? No. Red Noses do not contain latex. Red Noses are made out of polyurethane foam. The great news is that our new Red Noses are recyclable! After Red Nose Day, if you wish to recycle your Nose, just return it to your local Walgreens store and dispose of the Nose in a designated recycle bin located at the front of our stores. We will take care of the rest. If only $1.30 of each Red Nose purchase goes to charity, where does the other 70¢ go? Red Noses are sold for $2 each, with $1.30 being contributed to the Red Nose Day Fund. The remaining amount contributes to the cost of a Red Nose—Walgreens does not make a profit from Red Nose sales. No portion of the purchase is tax deductible. How much of each purchase of Red Nose Day Products are donated to the Red Nose Day Fund? All profits from the purchase of a Red Nose or other Red Nose Day merchandise (Pin Badge, Wristband or Pen) are donated to the Red Nose Day Fund, as well as 100 percent of any cash donations. In four years we have helped Red Nose Day raise nearly $150 million and helped more than sixteen million children living in poverty. Thank you for your support! Why do Red Noses ring up with sales tax? Walgreens is not a tax-exempt organization. These sales are taxable as Walgreens is purchasing the Red Noses, adding them to our inventory for resale and selling them through our cash registers, which makes them part of our sales and taxable. Walgreens is donating all profits from every sale to the Red Nose Day Fund, which is tax exempt, but that has no bearing on the original sales made at the cash register. How does the Red Nose Day fund work? The Red Nose Day Fund provides grants to organizations for programs in America and around the world that ensure children who are living in poverty are safe, healthy and educated. Red Nose Day's 2019 Grantee Partners include the Boys & Girls Clubs of America; charity: water; City Year; Children's Health Fund; Covenant House; Feeding America; International Rescue Committee; Laureus Sport for Good; Save the Children; The Global Fund; and UnidosUS. Learn more about Red Nose Day at RedNoseDay.org. 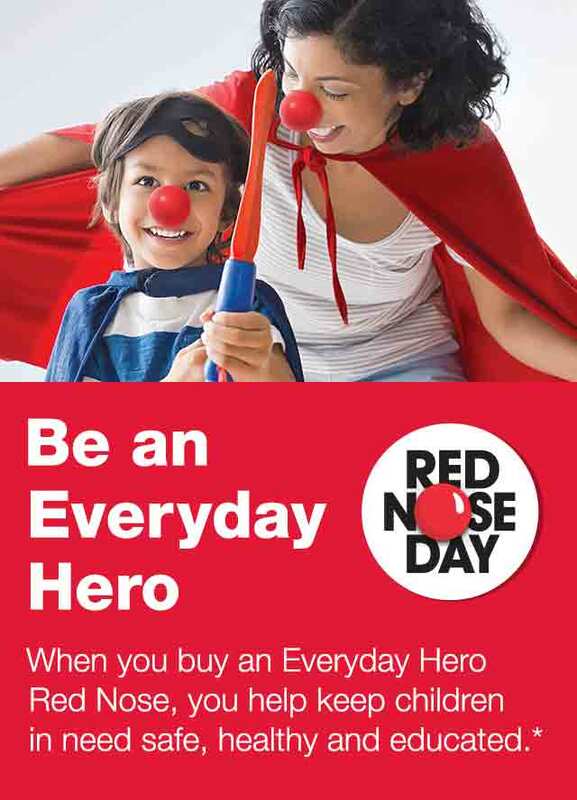 * From April 22, 2019 thru June 1, 2019, Walgreens will donate 50% of the retail purchase price of every Red Nose, Wristband, Pen and Pin Badge sold to Comic Relief Inc.'s Red Nose Day Fund, which helps lift children out of poverty in the U.S. and internationally. For more information, visit RedNoseDay.org. This contribution is not tax deductible. 6 Walgreens vendors who support Red Nose Day have contributed to a flat donation to Comic Relief. Please support their decisions by buying their products this month. Additional purchases won't affect the donation. 7 Walgreens will donate 1% of participating products' retail sales made 1/1/18-12/31/20 to Vitamin Angels.